Who doesn’t like a post-workout refreshing glass of thick chilled smoothie. It is a burst of flavor, fruitiness and nutrition that you deserve for putting in the effort to fitness and health. Often, we might not be sure which fruits or ingredients mix well in these power-packed drinks. Well worry not as we are here to help with the 3 most dense and lip-smacking smoothie recipes to offer. 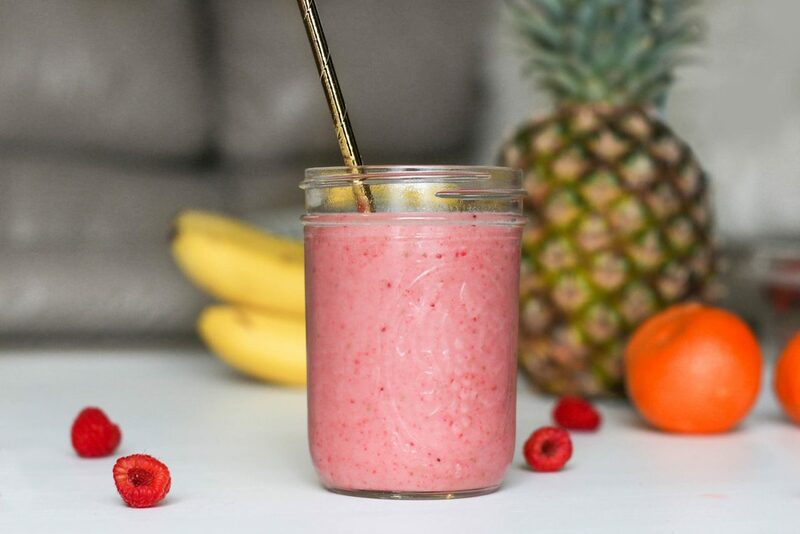 Banana and strawberry can be a nice and smooth blend packed with energy and flavor. Let us look at what we need for the recipe and their advantages. 1/4th cup crushed granola- Increases energy in body. Fiber in granola absorbs excess fluid making you feel full. 2 tablespoons of crushed walnuts- It is rich in calcium for the bones as well as mono- and poly-saturated fats(good fats). Walnuts are a powerhouse of energy boost. 1 cup Greek yogurt (chilled)- This provide calcium and protein for the bone and muscle health. Greek Yogurt is a well-known workout recovery food that also cuts down on the stubborn waist fat. This unique combination of fruits give a zing to the flavor with a dash of healthy benefits. Here are the simple ingredients. 1 whole banana freshly chopped- Bananas keep the heart health steady. Due to its low levels of calories, it is a weight loss -friendly ingredient in your diet. 240ml unsweetened almond milk- Due to being low in sugar, it is perfect as a substitute for regular milk. Since dairy milk does not suit well with most fruits, almond milk is a perfect fusion base. Both are star ingredients in our breakfast menu. Well supplied with rich fibers and nutrients, oatmeal and banana provide a wholesome breakfast meal. But how about spicing up the and make a filling smoothie from the ingredients we normally eat up from a bowl? We’ll let’s get blending. 1 whole banana, finely chopped- As mentioned above, it is aids in weight loss and provides sufficient energy. 3/4th cup milk (chilled)- Calcium and Phosphorous in milk help with improving bone strength. Due to its protein content, dairy milk provides a good amount of energy regaining through workout. 1 tablespoon peanut butter- Peanut butter is essential for both bones and muscles. Potassium in peanut butter gives proper muscle building nutrients while bones are strengthened through magnesium. Hopefully, the recipes are worth drooling, so enjoy the treats post workout as a source of health and motivation.